The temperatures are rising, the days are longer, and it’s finally that time again. It’s summer time! And what better way to celebrate the weather than by heading to the desert for some fun. If you’re looking for some fun, you’ll surely find it here. Gay Palm Springs is the renowned haven of summer entertainment!Few cities in the world embrace their vibrant visitors with much style and comfort like Palm Springs. Have a toast with your besties at premier gay bars, dance the night away, or dress up for some serious karaoke. Whether you’re gathering up some friends, going solo, or bringing your one and only, the city offers some of the most memorable experiences. In honor of summer, we highlighted some of the top summer entertainment ideas for you to discover in the heart of Palm Springs. The scene heats up when the sun goes down! Nightlife is all fun and games in the gay Palm Springs district. Gay bars are the Palm Springs summer entertainment oasis. It’s not difficult to find what scene you feel most comfortable in. Whether you’re feeling quirky, fabulous, or just wanting to relax, there’s a bar for you. Scout the best gay bars for happy hour specials and primetime entertainment. Enjoy karaoke, drag performances, and the best dance DJs spinning hits that will leave you dancing the night away. Saying “I do” soon? Skip the traditional Vegas scene and have a weekend of fun in Palm Springs before tying the knot. Prepare for some relaxation and fun with your friends. Palm Springs offers the best ways to send off the bride or groom. With gourmet restaurants, lively bars, exclusive pool time, and affordable world-class resorts, bridal parties in Palm Springs are irreplaceable. Maybe you’ve been lounging in the pool all day and finally feel reenergized. Sing your heart out at the best karaoke bars in Palm Springs. Or if you don’t sing, watching your friends try to sing is always a great time. Paint the town with your group, grab a couple of shots, and create some memories. You can also meet some welcoming locals and enjoy fabulous drag performances at the Retroroom Lounge. Indulge in tranquility at some of the best spas in Palm Springs. Take the stress off and relax in healing mineral waters while enjoying beautiful mountain views. You can pamper yourself at hot water spas, luxury meditation spots, or silence the world during a sound bath. Make health a priority while visiting the desert. 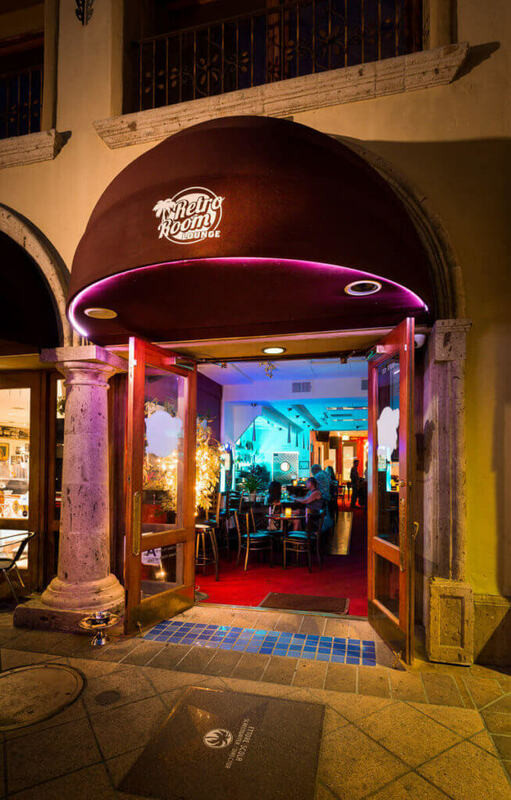 If you’re looking for a vibrant and intimate bar atmosphere, great karaoke, and interactive drag shows, come stop by the Retroroom Lounge in gay Palm Springs! Our handcrafted cocktails remain top tier and our interior is reminiscent of the rat pack days. We continually add new entertainment to our lineup and champion our everyday Happy Hour until 7pm. The Retroroom Lounge offers bachelorette party hosting, drag shows, the best karaoke and a home-style livelihood. Come for a drink and stay for the entertainment!